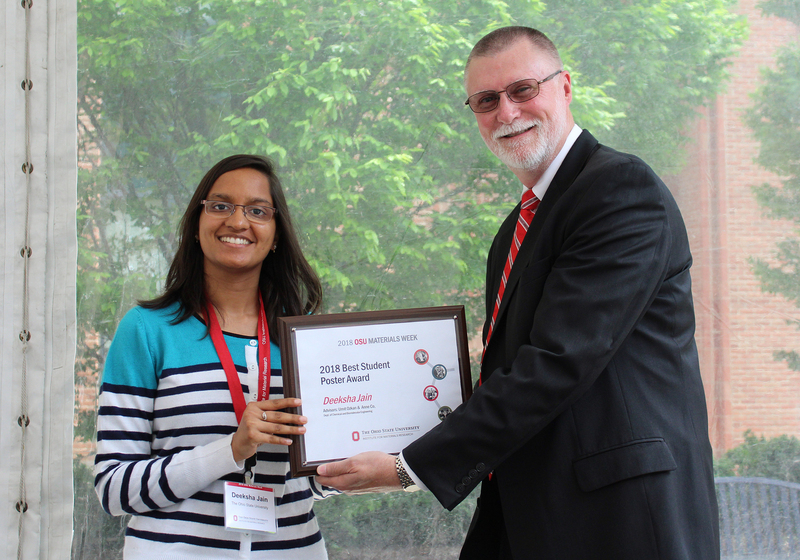 Click a thumbnail to view the attending Top 10 Student Poster awardees with Ohio State Executive Vice President and Provost Bruce McPheron. 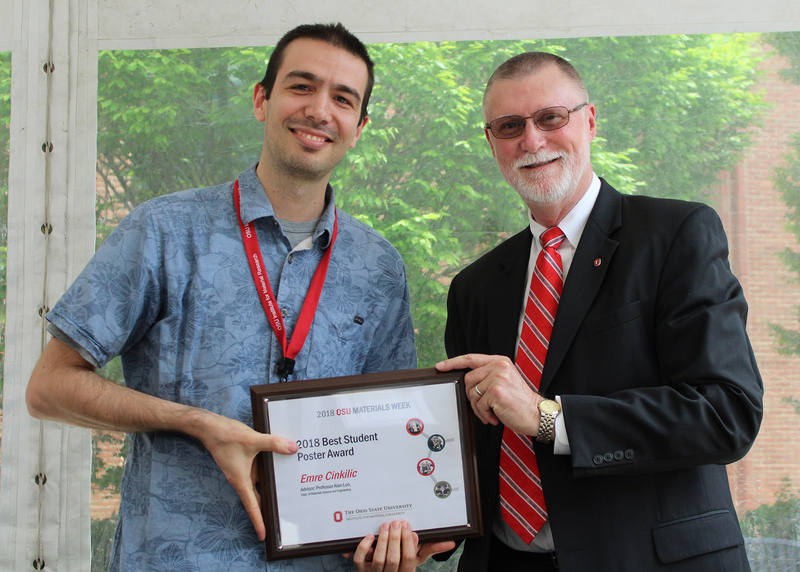 More than a hundred student and postdoctoral researchers at The Ohio State University came together to share their work in materials-allied fields with researchers from across the country at a two-day series of poster sessions during 2018 OSU Materials Week, held May 8 to 11. 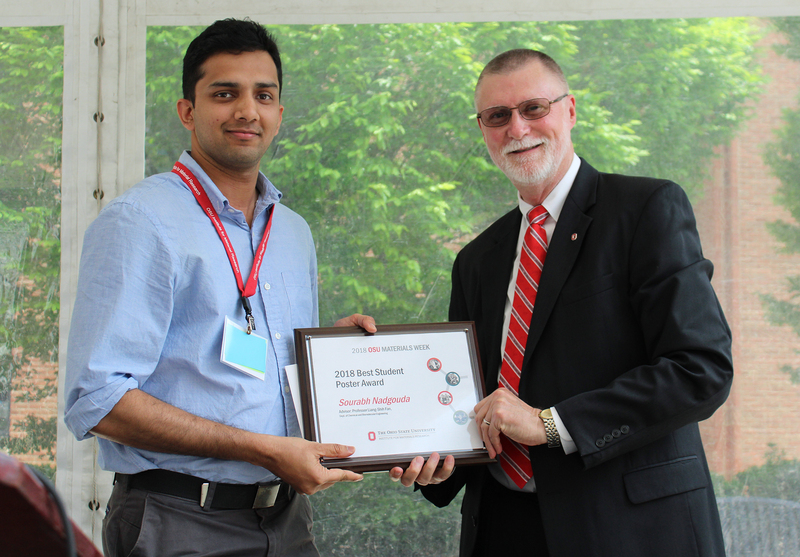 The Institute for Materials Research (IMR) hosted the poster sessions to allow undergraduate and graduate students at Ohio State an opportunity to share their work and receive feedback from professors and students of varying disciplines. 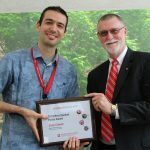 Students, postdoctoral researchers and professors swarmed through the Blackwell Inn ballroom as judges and visitors made their ways from poster to poster. Researchers were allowed five minutes to present their research. Presentations were followed by five-minute question-and-answer sessions between small groups of judges and each presenter. Some students spent their down time patiently waiting their turn to present their research posters again. Others took the opportunity to visit fellow students’ stations and learn about the work of their peers. 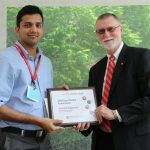 Beyond the opportunity to simply meet fellow student researchers, Karim appreciated the thought-provoking questions posed by both students and faculty judges. 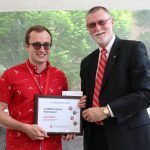 Among the judges was IMR Associate Director Glenn Daehn, the Mars G. Fontana Professor in the Department Materials Science and Engineering, who said he saw plenty of promising work on display as he walked through the rows of posters. 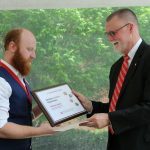 For him, being a judge gave an opportunity to meet new students, ask them questions that might be outside the immediate interests of their advisors, and help them connect their work to the broader world. Ninety-five students were eligible to present this year. Their posters were judged on aspects such as content, organization and overall clarity. Postdoctoral researchers were invited to present, but were not eligible for awards. 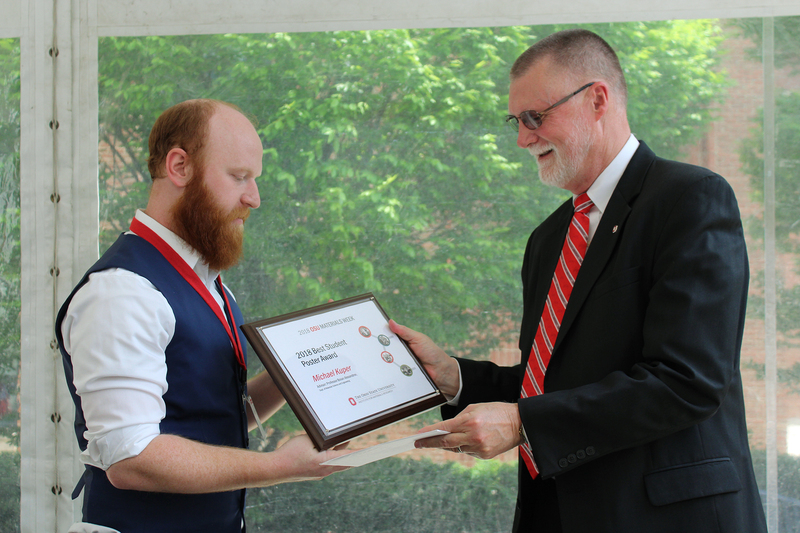 Awards were presented by Ohio State Executive Vice President and Provost Bruce McPheron. 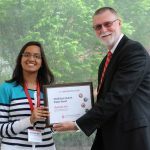 Below are our Top 10 Student Poster awardees. 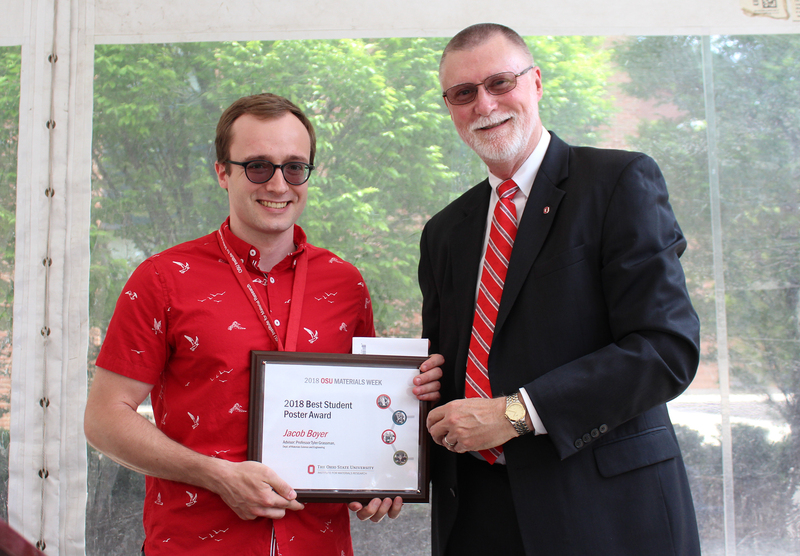 The Institute for Materials Research is an interdisciplinary institute that works across colleges and departments at The Ohio State University to facilitate, promote and coordinate research and infrastructure related to the science and engineering of materials. This entry was posted in Awards, Events, News, Students and tagged materials research, Materials Week by mhuson. Bookmark the permalink.